Sony Adds Walkman X-Series to Line | OhGizmo! By Shane McGlaun on 05/13/09 • Leave a comment! I still think of those giant yellow cassette players from the 1980’s when I hear the Walkman name. It also reminds me of those huge headphones with the built-in FM radio sporting the giant antenna that I used to see people wearing when they ran. I’m surprised most joggers didn’t end up with neck injuries from the massive things. Sony has added a new product to the Walkman line that is slick and sounds a lot like the iPod touch. 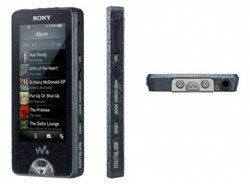 The new gadget is the Walkman X-series and it is available in 16GB for $299 and 32GB for $399. Other than the amount of storage, the two models are the same. Both sport a 3-inch OLED screen for video in WMV or MPEG-4 formats. Noise reduction technology and special EX headphones work together to eliminate 98% of external sounds from the environment they are worn in. Sony says these are its first products with integrated Wi-Fi in the Walkman range. The player can access Slacker Radio and YouTube over Wi-Fi. The players are set to ship in mid-June.